Kirby turns 23 today. Let’s celebrate the pink blob’s early twenties by looking back at the times he proved himself a worthy foe in Super Smash Bros. When I went looking around for legendary Kirby moments in preparation for his birthday, however, I ended up feeling a tad disappointed. 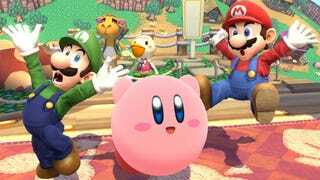 Despite Kirby’s ubiquity in the casual-friendly, party game version of Smash, he’s doesn’t have that big a presence in the game’s high-level competitive scene. The American pro Smash-er ChuDat became well-known as the world’s best Kirby player, but that was during the Brawl days on the original Wii. There is one area where Kirby’s proving himself to be a powerhouse, however: in Smash Bros. games with custom moves enabled. When I asked the Smash commentator and sometimes pro player Rich King, better known by his online moniker Keitaro, for his favorite Kirby plays, he sent me two recent clips showing a competitive player known as Blue using Custom Kirby to his full, devastating potential. Damn. Luigi was only at 54 percent damage at that point. 54 percent! That’s not nearly enough to make for a fatality moment in most Smash games...unless you accidentally self-destruct, I guess. Ouch. If only she knew to grab Kirby. That’s the only way! Stuff like the newly-terrifying Kirby is a big part of what’s gonna make Smash Bros. so interesting going forward, as custom moves and other diverse rules tease their way into more and more of the game’s ongoing tournaments. Who knows where Kirby will be by the time he turns 24.